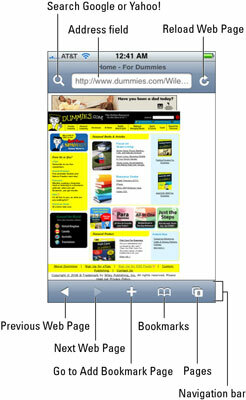 You can open several Web pages at the same time on your iPhone, using Safari. Once the Web pages are open, Safari lets you breeze your way between them. Tap the Pages icon, which is on the right side of the navigation bar at the bottom of the screen, and then tap New Page on the screen that pops up next. Tap the address field and type a URL for your new page. Flick your finger to see open pages. The number inside the Pages icon lets you know how many pages are open. 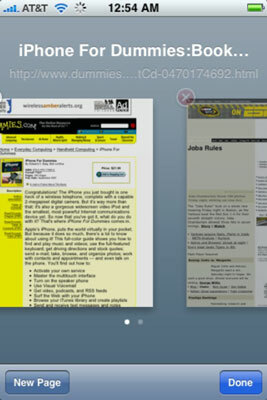 To see the other open pages, flick your finger to the left or right, as shown here. Tap a page to have it take over the full screen. To close one of your open Web pages, tap the white x in the red circle, which appears in the upper-left corner of each open page.